Create a quiz using How questions behave: Interactive with multiple tries and all review options on. Ensure that the questions are on more than one page. If not, repaginate. Click the padlock on the right of one question, so it can only be answered once the previous one has been. Verify that the dependent question is shown grey in the navigation, with a padlock icon. Verify that after you have seen the description, and then gone on to the next page, it is shown with the bottom half of the button grey. Try to click Check on a question without entering an answer. Verify that a red warning triangle is shown in that navigation button, to correspond to the validation error in the question. Verify that when you get a question right, the bottom half of the button goes green, with a white tick. Verify that when you get a question partially correct, the bottom half of the button goes orange, with a white circle in. Verify that when you get a question wrong, the bottom of the button goes red, with no icon. Verify that once you have saved an answer to the Essay, the bottom of the button goes grey. Verify that when you flag a question, a red triangle appear at the top right of the corresponding button. Verify that questions on the current page are shown with a thicker border. Use your browser's developer tool, to edit the text on one of the buttons to have 3 digits, and verify that the number fits. On the review page, not that all the questions are on one page, but that none of the navigation buttons have a specially thick border. Create a quiz using How questions behave: Interactive with multiple tries and all review options on. Add several questions, including at least on Description, one Essay, and three automatically graded questions. (At least one, like a matching question, that you can get partially right.) Ensure that the questions are on more than one page. If not, repaginate. Click the padlock on the right of one question, so it can only be answered once the previous one has been. Preview the quiz. 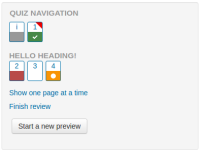 Verify that the dependent question is shown grey in the navigation, with a padlock icon. Verify that after you have seen the description, and then gone on to the next page, it is shown with the bottom half of the button grey. Try to click Check on a question without entering an answer. Verify that a red warning triangle is shown in that navigation button, to correspond to the validation error in the question. Verify that when you get a question right, the bottom half of the button goes green, with a white tick. Verify that when you get a question partially correct, the bottom half of the button goes orange, with a white circle in. Verify that when you get a question wrong, the bottom of the button goes red, with no icon. Verify that once you have saved an answer to the Essay, the bottom of the button goes grey. Verify that when you flag a question, a red triangle appear at the top right of the corresponding button. Verify that questions on the current page are shown with a thicker border. Use your browser's developer tool, to edit the text on one of the buttons to have 3 digits, and verify that the number fits. Submit the quiz. On the review page, not that all the questions are on one page, but that none of the navigation buttons have a specially thick border. Possibly for bootstrap base only?